One of the world's leading voices of conscience on the question of genocide and human rights is Samantha Power, who is now the U.S. Ambassador to the U.N.
On Monday, she spoke with CNN’s Fred Pleitgen, in for Christiane Amanpour, from the Rwandan capital Kigali, where that country was marking 20 years since its horrific genocide. Click above to see their conversation. Without “strong leadership,” Rwanda would have been unable to modernize and change at the pace it has in the 20 years since its horrific genocide, former British Prime Minister Tony Blair told CNN’s Fred Pleitgen, in for Christiane Amanpour, on Monday. The country on Monday marked 20 years since nearly 800,000 people were murdered in about 100 days. Rwanda has seen incredible modernization in the past two decades, Blair said, lifting “a million people” out of poverty, and getting huge reductions in malaria and maternal and child mortality, among other achievements. While many credit President Paul Kagame with those successes, some also accuse the leader of stifling Rwanda’s opposition and having authoritarian tendencies. In an interview with Amanpour last year, Kagame said she should not “worry” about whether he will step down at the end of his constitutionally limited term of office in 2017. Pleitgen questioned Blair – who as founder of the Africa Governance Initiative serves as an informal adviser to Kagame – about the president’s record. 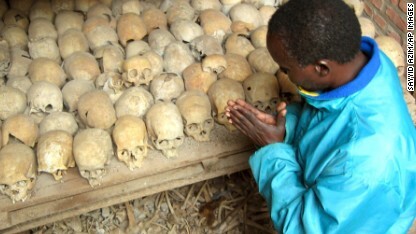 Has the world learned its lesson from the genocide - now 20 years old - in Rwanda? "I can see what is happening in Syria, I can see what is happening in the Central African Republic," Rwandan Justice Minister Busingye Johnston told CNN's Christiane Amanpour. "I'm not so sure that the world is putting out good mechanisms to ensure something like this never happens again. "This kind of eruption can happen." You can watch more of Amanpour's interview with Busingye here. CNN's Christiane Amanpour reports on the couple whose marriage is a mission for Rwanda; Click above to see their search for justice, twenty years after the genocide. Hundreds of thousands of women were raped during those 100 days of terror in Rwanda – but many of those victims of sexual violence still haven't found justice, and some find it hard to forgive. CNN’s Nima Elbagir reports. Click above to watch. Twenty years after nearly one million Rwandans were slaughtered in just 100 days, Rwandan Justice Minister Busingye Johnston said that the choice of reconciliation over traditional justice was one of necessity. The Rwandan justice minister tells Christiane Amanpour an "eye for an eye" would have left "very many" blind. In the 20 years since its horrific genocide, Rwanda has undergone a startling transformation unseen anywhere in the world. Rwanda's president, Paul Kagame, has been a darling of the West ever since he led his country out of the terrible 1994 genocide that left up to one million people dead. After the genocide, Kagame brought economic and social progress to Rwanda by effectively using the foreign aid flowing in from the international community. These funds make up nearly half of the country’s budget. But now, the country's economic lifeline is in jeopardy since the United Nations accused Rwanda of backing rebels in neighboring Democratic Republic of Congo. The U.N. says the country has helped to create and militarily support the “M23” rebel group that wants to overthrow the democratically-elected government of President Joseph Kabila. Watch the complete interview with Rwanda's president on our podcast. Watch the complete edition on 'The Story of Stuff' on our podcast. (CNN) - Rwandan President Paul Kagame hit back Monday at human rights activists who say he's behaving like an autocrat and fueling a bloody civil war in Rwanda's neighbor, Congo. "If you are talking about people in the human rights community from outside... I have an issue with this," Kagame said, 16 years after he was hailed as a hero for ending a genocide that killed at least 800,000 people. "You tend to make a judgment of a country, 11 million people, on what a couple of people have said and (they) don't take into account what Rwandans say." Kagame added, "Nobody has asked the Rwandans ... it's as if they don't matter in the eyes of the human rights people. It's our own decisions in the end." He said everyone in Rwanda has to play by the rules and be accountable. "There has to be leadership to make things move in the right direction," Kagame stated.